A new 40 metre Sunseeker 131 model motor yacht has been sold and delivered to the Mediterranean by Matthew Stanton at Sunseeker Monaco. 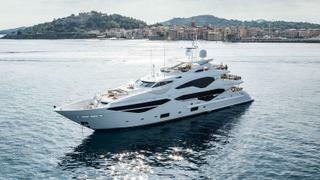 Built in GRP by British yard Sunseeker International, the yacht has been named SH Magic by her new owners. The three-deck Sunseeker 131 represents an evolution of Sunseeker's 40-metre platform and is based on the builder's tried and tested deep-V hull. On the water, twin 3,138hp MTU diesel engines have a top speed of 23 knots and a cruising range of 1,500 nautical miles at 10 knots. SH Magic’s interior layout sleeps 12 guests in six cabins comprising a master suite, VIP suite, two doubles and two twins, all with entertainment centres and en suite bathroom facilities. A new feature in this range is the extensive use of glass in the master suite, saloon and sky lounge to allow for more light-filled spaces and to make the interiors seem larger. The asking price of SH Magic has been withheld.